Terry was a bruising left shooting left-winger on my midget team. I was informed early on that his favourite play was to barrel down the left wing and smoke one. Because of his size, few got in his way. His shot was indeed a ripper, except it mostly missed the net wide and exited the zone. He also wasn’t scoring. Now you just can’t tell a 16 year old with a cannon NOT to use it. You need to find a way to make him use it effectively. My solution? I put him on right wing. For one thing, I’ve always liked opposite shots on wings for offence and I’d built attacks around it. When Terry went to the right side, he initially complained he could no longer use his shot. He said it was awkward. Correct, I said. But try it anyway. So he did. His technical issue of over-shooting wasn’t remedied, but now the deficiency led to shots on the short side and on net. He had to turn his body to make the shot which meant carrying it further. Suddenly his shots produced rebounds and goals. In the provincials, he was a bonafide threat. The next season, in junior, he returned to left wing. But for my team’s purposes that year and for him to have success, the switch worked. This season, during a stint in junior, I got tired of hearing my group’s shots hitting the glass. As well, we were a low-scoring team with no natural offensive skill. As any coach can attest, you can preach all day long, buy somewhere along the line you need to take action. We already had a rule in warm up shooting drills: If anyone shot crossbar height or more, the goalie would leave the net for the next two shooters or plays. This though didn’t solve the team’s poor shooting record in games. Pushups did it. Ridiculous, I know. Any player who missed the net high in practice had to do five. I added “strategic” shooting drills. 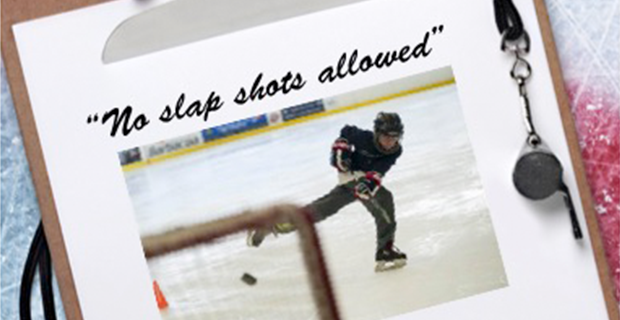 Punch the puck; hit the goalie’s pads; go short side; shoot on the ice only, etc. In the first practice only three kids paid the penalty. The next game just two. They started hitting the net all the time because they were now conscious of it – not to mention the penalty, which they viewed as silly. In the first game following these practice approaches, the team missed the net just five times. The next game, it reduced to four. We weren’t scoring more but we were getting more chances to score, even if they were bad ones. Defencemen were looking where they were shooting instead of taking desperate blind slapshots. Forwards were actually trying to get it on net. I wondered if they were afraid to be asked by the ref at the next whistle to drop down and do five if they missed. Gradually the gap between attempted shots and scoring chances on net narrowed while goals per game inched up. There was no ban on anything. Just a brief – perhaps silly – little penalty, but hey, it worked.